I decided to use the same bike show that I had for the first exercise in this project. I watched as a bike stunt rider performed his tricks (which were impressive) on his modified motorbike. 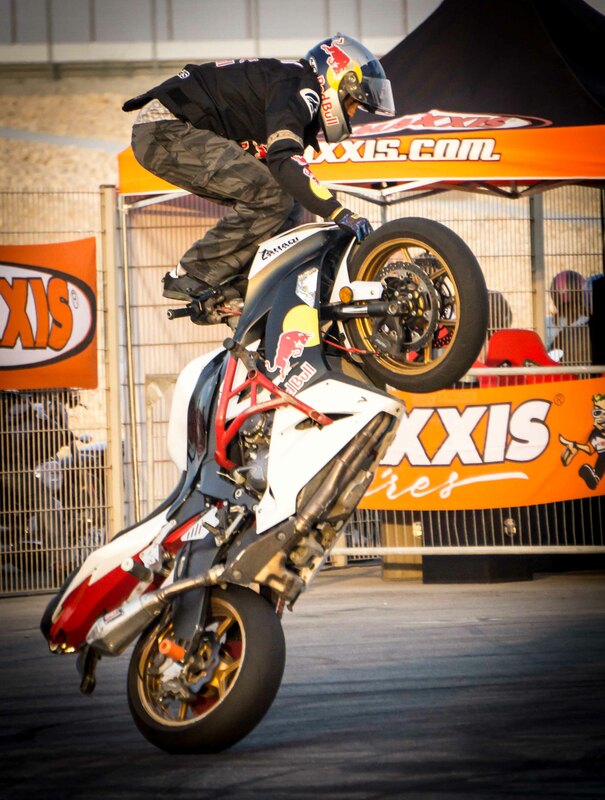 This guy was part of the Redbull sponsored stunt rider team and was here on visit just for the Dubai bike show. I watched as he throw his bike around a closed off track watched by spectators. He had another partner who was equally impressive doing similar tricks. I took a series of shots during the 10 min show and broke it down into a single image which I thought showed off the bikers skills the most. One of the event organisers was walking around filming the stunt bikers as they performed tricks to the crowd. As a pair, the stunt riders worked closer and closer together making tighter turns, as the rear wheels skidded on the tarmac and the front wheels almost locked together. Making the most of the closed track, one of the riders started to make the stunts more daring. From the total stunt show and one small mishap from one of the riders (not serious) the riders split up and I focused on the best of the two while he did his tricks. For me this was the ultimate stunt for the riders in the total set. Standing on the handlebars, moving around a closed track, while keeping perfect balance…very impressive! This was an interesting exercise making you think about what best shows off a final set of images. Many of the stunts were impressive, especially when you see it done just a few feet away, and not on the TV or internet.